Rugby star Martin Johnson has unveiled a portrait of himself at Leicester's New Walk Museum. It was painted by Leicester artist Bryan Organ and will hang in the museum, yards from Welford Road ground. The Tigers and ex-England captain, who announced his retirement this week, said: "I took a bit of persuading. I am very honoured that he has done it." Artist Bryan Organ said the scale of his 6ft 7in subject presented its own problems in the life-size portrait. Mr Organ, also from Leicester, has 15 portraits in the National Portrait Galley, including ones of Prince Charles, Prince Philip, Harold Macmillan and the Princess of Wales. He said: "The problem is scale, I was quite tall until I met Martin." The portrait will move from the New Walk Museum in September, to the Tigers' new stadium. The team is expected to ground share with Leicester City when they quit their current ground after 100 years. Johnson said it was a "little unreal" to see so many people present for the unveiling at the revamped museum. He said: "It is only 200 yards down the road to the recreation ground at Welford Road where I made my debut for the Tigers youth team 18 years ago and then you're are hanging in a museum. "It does make you feel a little bit old." The work will stand 24 inches off the ground and is a life-size picture of "Johnno". He lifted the Webb Ellis Cup when England won the 2003 World Cup after beating Australia. 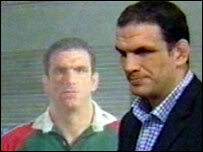 "Martin Johnson unveils Martin Johnson"